For other uses, see Ansaldo (disambiguation). Ansaldo was one of Italy's oldest and most important engineering companies, existing for 140 years from 1853 to 1993. The efforts paid off when Italy entered the war. In 1914 the company was worth 30 million lire, but its market value grew to 500 million in 1918. When the company issued shares in the summer of 1918 worth 400 million lire Ansaldo employed 80,000 workers, had dozens of factories and controlled companies such as A. Cerpelli & C., Banca industriale Italiana, Cantieri Officine Savoia, Dynamit Nobel, Gio.Fossati & C., Lloyd Italico, Nazionale di Navigazione, Pomilio, Società Idroelettrica Negri, and Transatlantica Italiana. After the end of World War II, conversion to peacetime production again caused problems for the company. 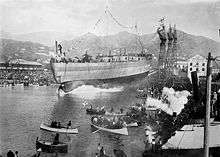 In 1948, IRI entrusted the company to Finmeccanica, which operated several reorganisation measures during the 1950s and 1960s, such as the relinquishing of all shipbuilding activities to Italcantieri of Trieste in 1966. From that year, Finmeccanica further engaged Ansaldo within its activities, and in 1980 they formed Italy's largest thermo-electric group. In 1993, Ansaldo ceased to exist as an independent entity, having been completely absorbed by Finmeccanica. Ansaldo Energia, involved in building electric power plants, based in Genoa. Ansaldo Caldaie, involved in building fired Steam Generators. Sofinter Group (Private Company located in Gallarate, Italy). Ansaldo Ricerche, involved in nuclear fusion technology, founded in 1987 by merging various research and development departments of Ansaldo and Nucleare Italiana Reattori Avanzati; it takes part in the international ITER project. Ansaldo Fuel Cells, founded in 1993 as a spin-off of the former, devoted to fuel cells. Ansaldo Nucleare, founded in 1989 by merging Ansaldo Meccanico Nucleare and Nucleare Italiana Reattori Avanzati; in 1999, it was absorbed by Ansaldo Energia, but in 2005 it was re-founded as a separate company, although 100%-controlled by Ansaldo Energia. Ansaldobreda, S.P.A., a train-building company born from the merger of Ansaldo Trasporti and Breda Ferroviaria. Ansaldo STS, railway signalling systems. Nidec ASI (formerly Ansaldo Industrial Systems). Former Finmeccanica Company, sold to the Japanese Nidec Group, in 2012 Nidec acquired Ansaldo Sistemi Industriali SpA. and becomes Nidec ASI S.p.A. Nidec ASI is a manufacturer of electric motors, their products are found in electrical engineering, electric motors and generators, control systems and automation for industrial applications. Nidec ASI is headquartered in Milan and has different subsidiaries in Italy in Genoa, Montebello Vicentino, Monfalcone and abroad in China, France, Germany, Romania, Russia, Japan and Singapore. Ansaldo A.300 (1919) Single-engine two-seat biplane utility aircraft. Three-seat versions were also built for reconnaissance use. Ansaldo AC.4 (1927) AC.2 with 420 hp (313.2 kW) FIAT A.20 engine. Fondazioneansaldo.it: Ansaldo Foundation (Fondazione Ansaldo) website—(Italian), devoted to documenting Ansaldo in Italian industrial history.